The beach at Forvie in April 2008, with the ruins of a bothy once used by salmon fishermen. When I was there the sand was being blown back down the beach. 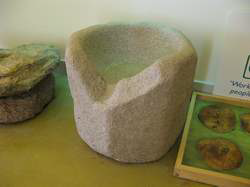 This object, thought to be the font from Forvie Kirk, is on display at the Stevenson Forvie Centre. Along the coast of north east Scotland, between Aberdeen and Inverness, there are several places where communities have disappeared as a result of the movement of sand. Elsewhere in this website we have seen how advancing sand dunes overwhelmed the town and castle of Kenfig, and how the prosperity of Dunwich was affected when the movement of a shingle spit altered its natural harbour. 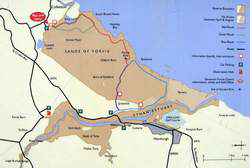 In the medieval period many settlements developed along the coast of the North Sea and the Moray Firth. They would have enjoyed a double economy that included fishing as well as agriculture. In addition the sea provided opportunities for more rapid, if sometimes hazardous, movement of goods and materials. 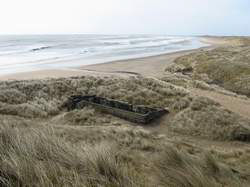 In this section we will take a look at two places, Forvie and the estate of Culbin, that had to be abandoned as they were being covered by sand, and two other places, Rattray and Findhorn, that were damaged by changes in the position of bars of sand and shingle. Although the original village of Findhorn was deserted I may have to concede that the community itself was not abandoned, as the people simply moved a short distance inland and joined with the people of Muirton to create a new village. Let us begin with the village of Forvie. 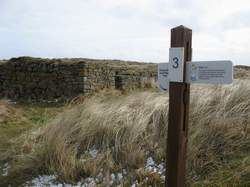 It was located in what is now the Forvie National Nature Reserve, about 14 miles north of Aberdeen. It was a few hundred yards inland from the present shoreline, close to a small stream that runs into the sea at a place now called Rockend. 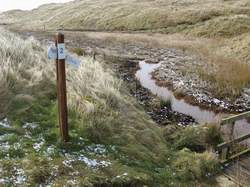 If the stream was roughly in the same position in the fourteen century it would have provided the main water supply to people living in Forvie. Much of the sand that now covers Forvie is thought to have been brought to the sea after the last glaciers in Scotland melted about 10,000 years ago. It would have been transported in huge quantities down the Ythan river and deposited at the mouth of the estuary. Since then there has been an overall movement of the sand in a northerly direction, with the result that quite a lot of it formed the sand dunes at Forvie. Not much is known about the village. All that is visible today is the lower part of the walls of the church, built at the highest part of the village. In the 1950s archaeologists examined the remains of the church, and also found a number of square shaped houses. More information about the excavations done in the 1950s can be found on the website of the RCAHMS. 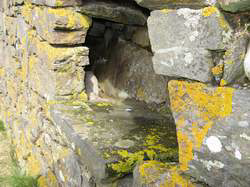 · The priest, who tells us that the church was built in the twelfth century and is dedicated to St Adamnan. · A farmer, who tells us that oats provide a good harvest, but is worried that by the time his children grow up the sand may have started to cover the fields. · A farmer’s wife, who cares for the animals, does some work in the fields, and does her best to keep sand out of the house. · A child, who collects water from the stream. She has noticed that the water and mud are orange red, and explains that the colour is due to the presence of iron. It is thought that the advancing sand finally made life intolerable in the village early in the fifteenth century. Supporting evidence comes from the fact that none of the burial remains found at the church are any later than this date.